Only a child’s geography would have mountains leading to the sea in a smooth, uninterrupted, downhill flow. We’ve been learning that for days now, but we’re a little slow on the uptake. Day 5 hammers it in yet again. 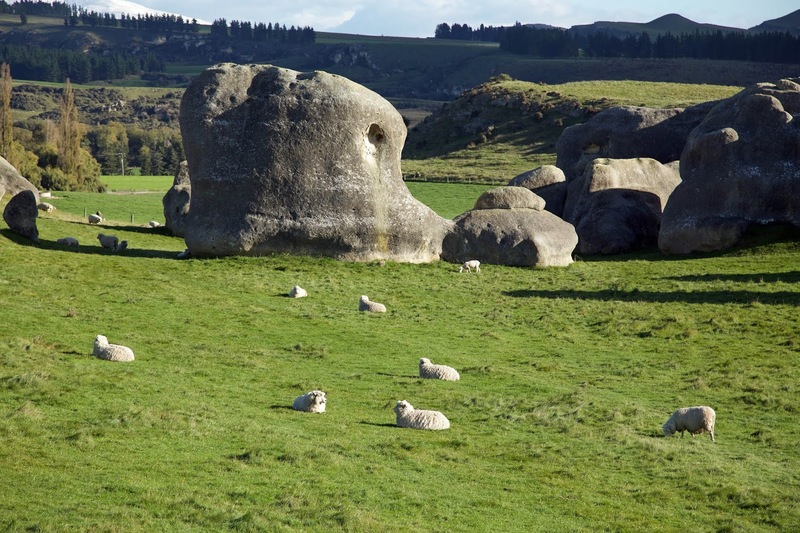 Our first uphill leads to and around Elephant Rocks, aptly named limestone lumps that stud the verdant grassland. The area is dotted with sheep the same hue as the rocks. We have more than 50km to ride, but there’s a relaxed feel to this, our final day. We’ve enjoyed a warming porridge for breakfast, ideal for the chill that’s still in the air. And now we’re enjoying the scene from Elephant Rocks. Beyond the green fields there’s plenty of snow on the grand sweep of higher hills and mountains to the west. 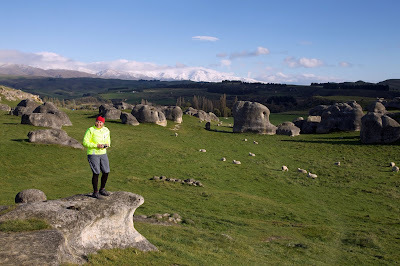 We warm up as we puff our way up and around the steep limestone hills. By the time we’re nearing Island Cliff, the sheep have been replaced by cattle, which shelter beneath the limestone escarpment. On the downhill run Tim has raced ahead, only to ride back to us from the bottom so he can fang down the slope again. I video his antics, including some brief airborne moments and a few whoops of delight. We pay for the fun with a long and steady climb. I’m behind now, having stopped for a few too many photographs, and no matter how hard I ride I can’t seem to catch up. It’s Tim’s turn to video as I struggle up the long last climb. The van is parked tantalisingly at the brow of a hill, and it feels as though everyone else is lined up like barrackers on Le Tour. This feeds both my pride and my stubborn streak. I’m not getting off and walking now! Accompanied by Tim’s mock sports commentary I wheeze and wobble my way to the top. At least I think it’s the top. It turns out there’s more hill to climb yet. That’s the bad news: the good news is that Joh is offering us a lift in Morrison for the kilometre or two to the top. 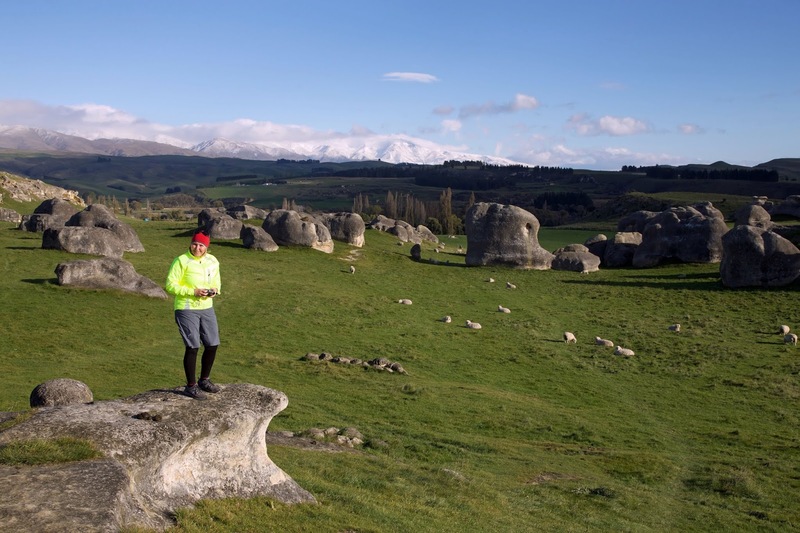 She wants us in Oamaru in reasonable shape, and not too late! My pride evaporates. As soon as I’ve got my breath back and had a coffee, I’m helping the others load bikes into the trailer. But now it’s Lynne’s turn to show a stubborn streak. She wants to keep riding to the top, albeit with e-bike assistance, so she sets off ahead of the van. We only catch up with her just before the (actual) top. Her smile is almost as wide as the views we’re now getting, including glimpses of the ocean. 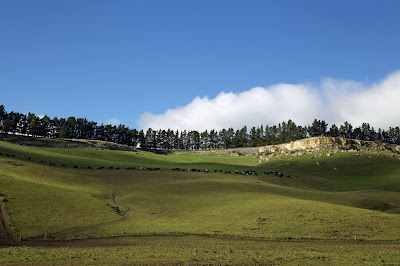 Has the landscape just been playing with us these past few days? Like some half-tamed beast, one moment it’s growled at us, the next it’s lifted us onto its back for a better view. We’ve certainly never been allowed to settle into complacency. But now we can actually see our destination, and it really does look as if it’s all downhill from here! 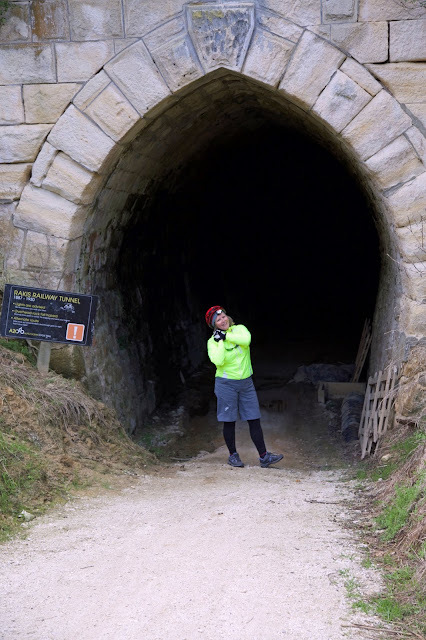 There are some exciting twists and turns to negotiate first, including the dark of the Rakis Railway Tunnel. (So that’s why we were supplied with torches!) Beyond the tunnel the track continues to follow an old rail line, curvaceous, gently inclined and all downhill. We speed down to our lunch stop near Windsor. 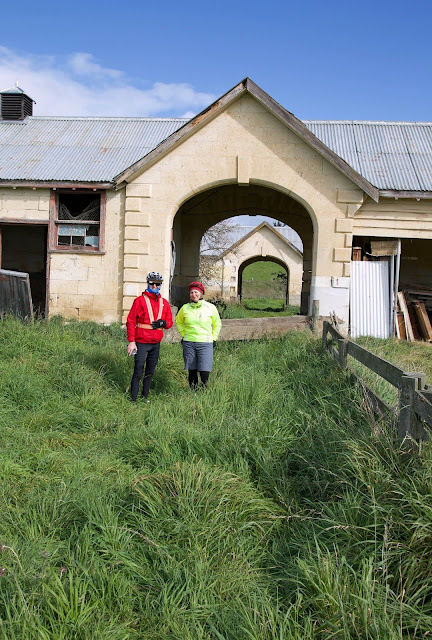 And then a route detour leads us to the fascinating Elderslie Estate, a grand Victorian era property that still reflects a bit of its former glory. Some say that the famous Phar Lap was born at the Elderslie stud, although it’s more likely that he was only conceived here. Regardless, even if he was only here as a twinkle in his sire’s eye, the stables have a grand-if-neglected place among the estate buildings. We continue on past the village of Enfield and on to the town of Weston. If it’s slightly uphill, we’re past worrying. The land-beast has continued to be in a playful, teasing mood, summoning up a final shower of rain to accompany us down the final few kilometres into Oamaru. 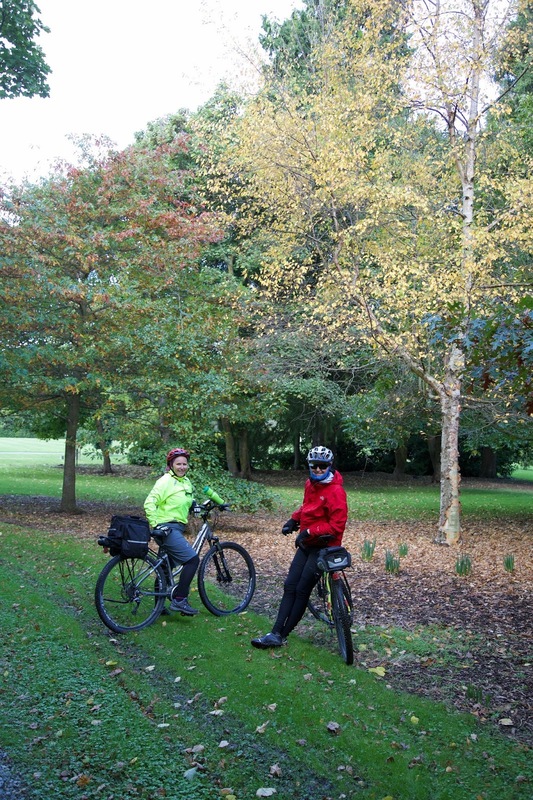 The sealed cycleway avoids the busy city outskirts, instead taking us in via the beautiful Oamaru Gardens. Tim, Lynne and I gather together in the gardens before processing into the city proper. We cross a few trafficked roads and ride into the old Victorian era precinct that surrounds the Oamaru Harbour and Friendly Bay. 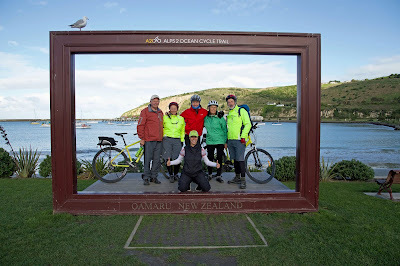 A large picture frame on the foreshore marks the end of the ride. After hugs and handshakes, we gather together in the frame. A friendly passer-by snaps a group photograph, and it’s all over. 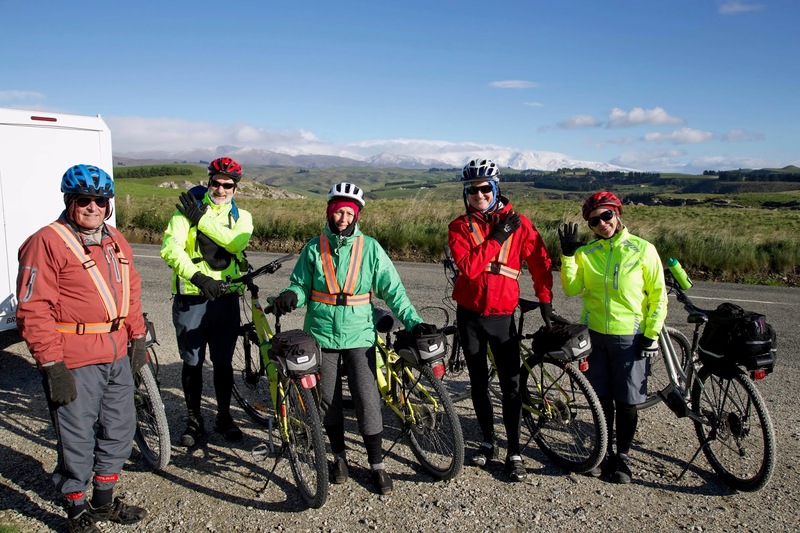 5 days, more than 260km across the South Island, from near its high point to this Pacific coast. As a final gesture I walk down to the shore of Friendly Bay and touch the water. The waves lap on the sand, small and gently percussive. I fancy it’s the sound of the land-beast wagging its tail.